I have often thought how lucky we braiders (and rug hookers) are in that we can pick up our projects with just a few minutes to spare and do a little more, enjoy a little more. Unlike pottery which is messy and needs a commitment of certain time. I have encouraged new braiders to look for a designated place in their homes where they can devote to their braiding so that it is out, visible and ready for those few minutes to spare. Well, now that I have gotten into dyeing (first wool, but lately more and more stretch velvet) that is not the case. Unless we have dyeing studios (lucky few), we dyers take over spaces for periods of time. 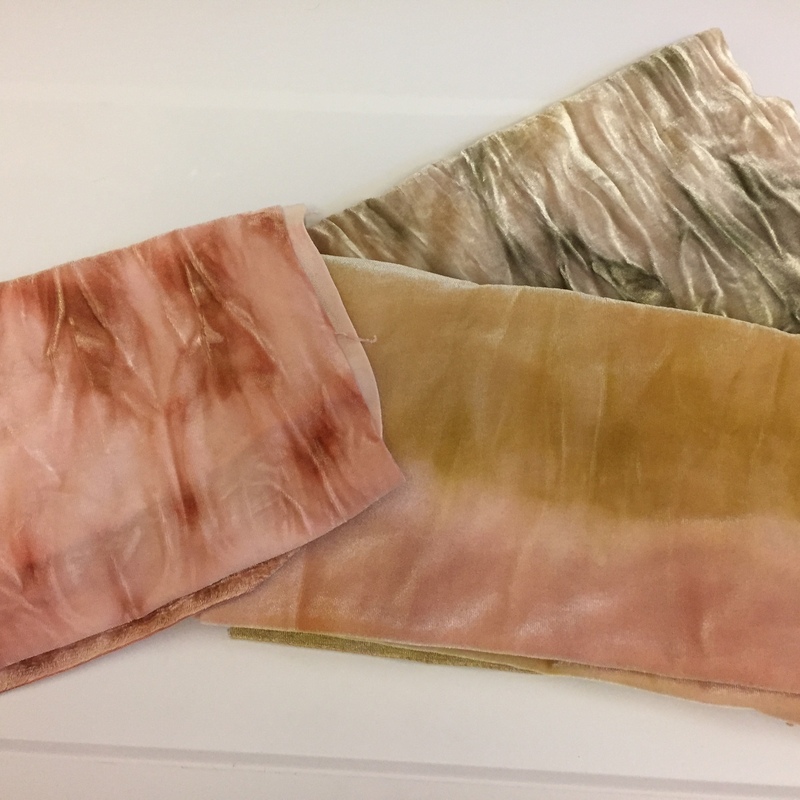 I had been dyeing velvet outside on the back porch since I don’t usually use the stove for velvet but do need multiple plugs for the assorted frypans, crockpots, prestopots, etc. which I use in the dyeing. And water to rinse. 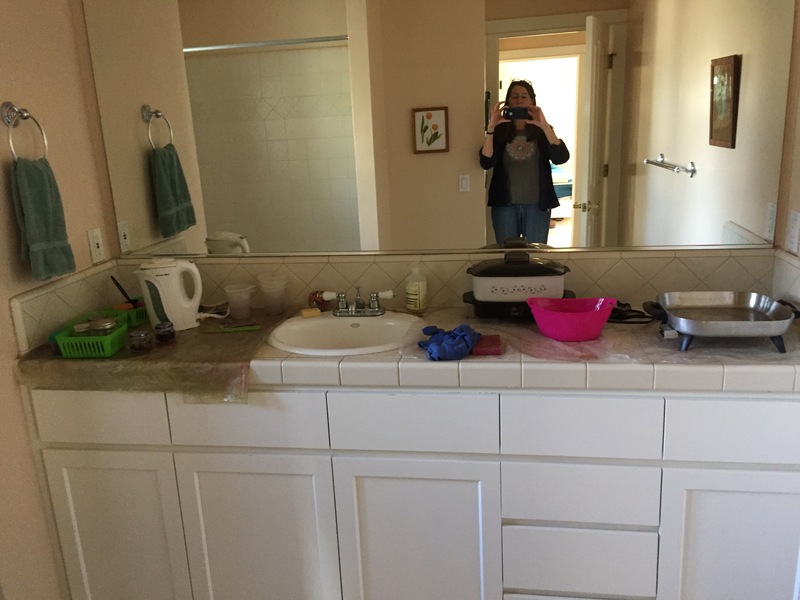 This weekend was stormy in California and so I decided to use the kitchen as I used to when I dye wool. I will blame my husband who was watching at least 10 football games in the same room, fixing a sardine(!) sandwich in ‘my dye kitchen’ then cleaning up etc. that made the dye experience less than pleasant. Perhaps it was also that I did not have enough velvet and am running out of dye AND had a small commission to try to dye some velvet for a hooking friend to hook car chrome silver, not as easy as it sounds. So I frenetically dyed, did all the cleanup and dried the dyed velvet. I had an epiphany in the middle of the night: why not commander the unused upstairs bathroom for my dyeing…not permanently but could keep it set up for several days at least. Water in the sink, not a deep sink but will work; 4 plugs; and next to my upstairs laundry room for drying. So I checked it out with the sardine eater who I am sure is happy he won’t be barked at in the dye bathroom like yesterday in the dye kitchen and I began moving a card table and dye things upstairs. I wasn’t too pleased with some of what I dyed yester day, so set up some reds, yellows, browns in two pots and redyed some patches for an autumn hooked/braided piece I will start soon. It was wonderful! Here are a couple of the pieces I dyed and a hat I am braiding from hand dyed velvet for a friend who loves hats. Velvet of course is not sturdy enough to use exclusively for walked on rugs but gives a unique shimmery contrast to wool in hooked and braided mats, baskets, hangings, etc. I have used velvet sparingly in floor rugs for emphasis and it is wearing well. Hooking and braiding only velvet is special too and can show off the randomness or patterns of the dyeing. Maybe it is my pharmacist background but I love dyeing! 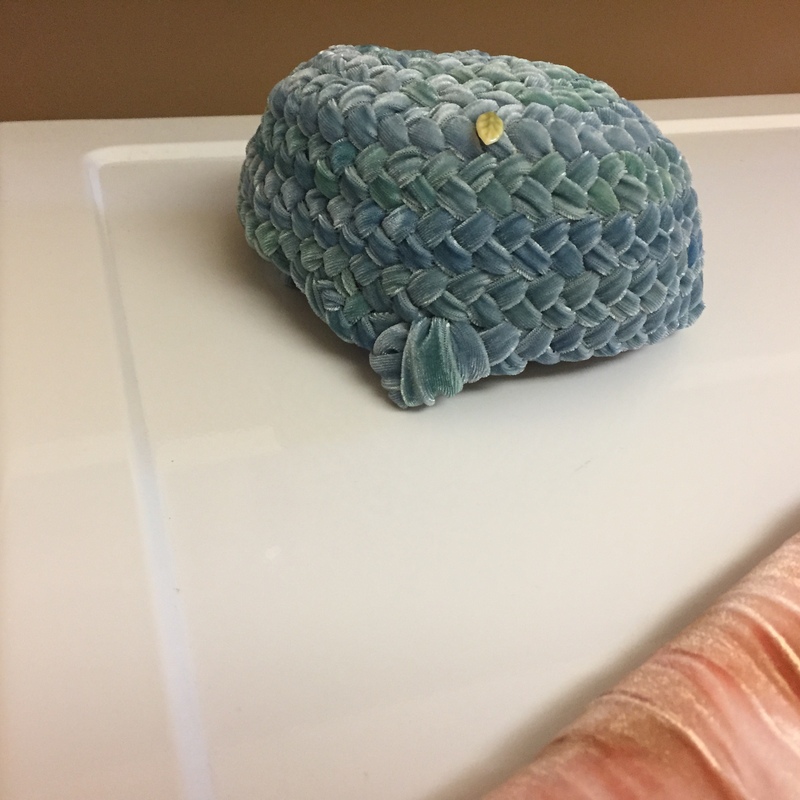 I am giving a class at the Valley Forge Braid In in May called Venturing into Velvet with the project a basket braided from hand-dyed velvet. Check out the website or contact me for information. Nancy Young’s rug with a pretty 9-strand multistrand border. Christine here. When I was in college, I had brief aspirations of being an English major. I loved courses like, “Women of Talents,” in which we read works by Doris Lessing, the Bronte sisters, Jane Austen, Margaret Atwood, Mary Shelley, Toni Morrison, Iris Murdoch, and Virginia Woolf. (We jumped around in centuries a bit). I could have continued with the major if it had involved only fiction….unfortunately there’s a thing called poetry that is also considered important. After almost failing a course in 19th Century American Poetry, I called it quits with that major. One of my favorite books from that time was Virginia Woolf’s, “A Room of One’s Own.” The author is famously quoted as saying, “A woman must have money and a room of her own if she is to write fiction.” In my own (non-poetic) way I have been thinking about the minimum requirements for other creative activities lately… such as rug braiding. Money always helps; money helps in just about every situation, especially since Dorr’s prices just went up. A room of my own is certainly nice, although I don’t think it’s necessary; I tend to braid in the living room on the couch, where I can quickly respond to incessant interruptions and demands from my family. However, a recent loss has helped me to understand one of my other minimum requirements for rug braiding: my minivan. I inherited the van from my father-in-law, who had toured the country in it one summer while my mother-in-law hadn’t yet quite fully descended into dementia. They travelled the country’s national parks, took a million photos that they made into a million slides, and stayed in hotels at night. Upon their return, he developed a bone infection that kept him hospitalized for two months, then rehab for another 3 months, while his wife went into assisted care and eventually the Alzheimer’s unit. My husband flew down to their home in South Carolina every Friday late afternoon and came back Monday mornings, and I took a leave of absence from work, because I simply couldn’t maintain my overnight “call” responsibilities, with little kids and a spouse home only Mon-Thurs. A pattern for this continuous, double corner, tapered heart is in the recent newsletter. In the meantime, the poor van sat lonely and unused in my father-in-law’s garage. We finally moved both in-laws up to Pittsburgh so that I could go back to work (still had over $100,000 in med school debt at that point) and my husband could visit them only 20 minutes’ drive away, rather than a plane ride. We had to bring the van up to Pittsburgh,too. At that point I was driving a 13-year old used Taurus station wagon that was on its last legs/wheels, so getting a 2003 van for free was very helpful. I didn’t like the van at first. I wasn’t used to being so high up off the road. I didn’t like how huge the van was – I felt as if I were driving a truck. It was white and I wouldn’t have chosen white. It was a pain to put the back seats up and down for extra kids and all the inevitable kid birthday parties and interminable Chuck-E-Cheese play-dates. The van just wasn’t my style. Now, at 55, I don’t have any style to worry about, and I have come to treasure the van. It is absolutely perfect for warehousing several bags of wool fabric that I have bought until my husband isn’t home and I can sneak them into the house without explaining to him why I just bought more wool. My van is great for trips to and from braid-ins, where I can load up the back with everything I need… given my indecisiveness about exactly which braided project I’m going to work on at any one moment, that can mean a lot of projects to bring with me. And when I have teaching jobs, I always have a lot of stuff that I have to bring, so the dear old van is perfect. I have an old GPS that I bought years ago, and have taped onto the dash with clear packing tape in what my daughter tells me is particularly unattractive (although very useful). To complement the look, my central column has a short and I can no longer see the numbers of the digital clock nor get my CD player to work. I now have an extension cord that plugs into the power adapter, and I plug a boombox CD player into that so that I can listen to my murder spy thrillers while I drive. Given how disastrous a housekeeper I am, it should come as no surprise that my car similarly has quite a few empty diet coke cans and other miscellany that my husband ostentatiously collects and puts into the recycling or trash before he rides with me (I have to drive or I get carsick, so I drive us everywhere). The other evening, I needed something from Target and I went out in the van. As I was pulling into a parking spot, the van died. Just died. There I was half-in and half-out of a parking space, and the van was unresponsive and comatose. In my usual fashion, I had forgotten my phone (I hate all phones) and I had to stand in line behind 20 people at Customer Service before I could call my husband and Triple A. I had to leave a message on my husband’s phone, and I got through to Triple A, and they said an hour. In the meantime, I went shopping for what I needed, then I hung out with the poor sick van. When it was long after my husband should have arrived, I went back in and waited in another line to use the phone. This time John answered, and it turns out he had gotten my message, and had gone to Target, and where was I? Well, when he had gotten my message, he hadn’t really listened to me, and he went to the Target he usually goes to instead of the one I told him to go to (we live equidistant between two Targets, and so I had been sure to specify). So I exercised great restraint and explained to him that No, Dear, I was at the other one, and could he please come wait with me in the dark creepy parking lot? Another slightly larger double corner heart. We got the van towed, and the mechanic couldn’t even look at the van for a couple days because he was so busy. In the meantime, I started catastrophizing and wondering how I was going to afford a new van (they start at $30,000) so that I could get one exactly like her as a replacement. I had to miss my weekly visit with my braiding buddy, Wanda. I started thinking unhappily of limited trunk spaces in more affordable sedans, and how would I ever manage to take everything I wanted to the braid in, in May. Then, my husband walked in, and dropped the keys in my lap. The old girl was fixed! It had been a simple belt issue that had taken them about 15 minutes to correct. My 2003 van was running again. But my brief, 48-hour stint of being van-less had been enough to make me realize just how much I depend on her for my braiding adventures (and the associated wool-gathering). So, bastardizing Virginia Woolf, “A woman needs money, a room of her own sure doesn’t hurt, and a 2003 white Honda minivan to braid rugs”… at least this woman, anyway! Yay, the registration for the Spring Braid In (May 5-7, 2017) goes online today! Go to: ValleyForgeRugBraidingGuild.com to register after 8 am. I hope that it’s a smooth process for everyone who registers. But if it isn’t, please email me (ccmanges@gmail.com) and I’ll do my best to help you out… after I get back and recover from my Florida “vacation” with the family on Monday, January 2. We have a wonderful list of fun classes, a great speaker, and as always, my favorite part of every gathering is the “Show and Tell” of our beautiful hand braided rugs. This year’s Rug Challenge is “The Four Seasons,” and every year people make amazing rugs around our challenge topics. I can’t wait to see what everyone has made!